How to Export iMovie Project/Video to FLV? As efficient video editing software on Mac, iMovie offers professional and powerful editing functions for users. People can personalize and enrich their video or movies with iMovie as they wish. Once all editing work is done, the creation can be exported into several popular video formats. Let's have a look at the formats that iMovie supports exporting to. 3GP Low resolution, small sized video suit to 3G mobile phone. AVI An old video format works on Windows system. DV Standard resolution video, widely accepted by most video editing software. MPEG-4 Most widely used, popular, advanced video formats. QuickTime Movie Similar as MPEG-4, but widely used in Apple software and devices. iPhone QuickTime Movie optimized for Apple iPhone. iPod QuickTime Movie optimized for Apple iPod. Apple TV QuickTime Movie optimized for Apple TV. You may notice that iMovie only exports project to a limited number of video formats and FLV is not included. So what do we need to do to get FLV files after we edit a video in iMovie very hard? One available and easy solution of all times is to convert iMovie project to FLV with the most effective iMovie to FLV Converter. 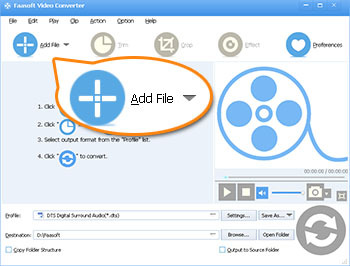 A lot of converter applications are available so far, but if you hope to convert iMovie video to FLV with the highest output quality and fastest conversion speed, you'd better to choose a reliable and powerful converter software like Faasoft Video Converter (for Mac, for Windows), which is a widely recommended iMovie to FLV Converter for both Mac and Windows users. This powerful video converter also lets users to convert a number of video files to iMovie formats like MP4 to iMovie, WMV to iMovie, AVI/AVCHD/MKV/MXF/SWF/WebM/MTS to iMovie. First of all, click "Free Download" button to download Faasoft iMovie Project to FLV Converter as your operating system and install it rightly on your computer. Next, I'll show you how to do the conversion on Windows. If you are Mac users, follow the same steps as below. At the beginning, export iMovie project to MOV, AVI, MP4, DV and other formats that iMovie supports. Run Faasoft Video Converter and then drag iMovie project to the primary window of the program. Or hit "Add File" button and browse your computer to have the chance to choose iMovie video that you want to convert. The imported file will be loaded in Faasoft Video Converter automatically immediately. Then click "Profile" drop-down button and select "FLV Flash Video Format (*.flv)" as target format. Faasoft Video Converter supports converting video to many popular formats like MP4, AVI, MOV, WMV, FLV, ASF, DV, OGV, WebM, MKV, RM and more. When the output format is set, hit the big "Convert" button to let the converter start the conversion from iMovie video to FLV. And now what you should do is to patiently wait for the video to be converted. Once the conversion is done, go to "Open Folder" button to get the FLV file.